I've been learning about so many great monthly subscription services over the last few months. This one has definitely caught my attention. Let me introduce you to #JadeCrate. It is a boho/vintage style subscription box, filled with 5-7 products, including organic, natural skincare, artisan made, and beautifully unique things. First things first. I am obsessed with the color teal, so I was happy to see a lot of that inside. Secondly the box that everything came in was beautifully designed, with elephants, mandalas, and flowers, (three of my favorite things). This pretty scarf will be perfect for wearing in the fall or winter. It is artisan made. Love it. Here are some gorgeous elephant earrings. So happy to now own these. I've actually been wearing these every day since they arrived. I even like the little storage pouch that both of these items were packed in. This is the ring that you saw pictured in the previous picture. Again with the teal/aqua. So cute! This lotion will be used up pretty quickly over the next few weeks, since the cooler weather tends to be harsh on my skin! Organic product, by the way. I love the matching design from the box, that was put on the bottle. Again, gorgeous!! Am I right? This could be used to hold pencils/pens, hair brushes, makeup brushes, a candle, snacks, etc...I'm currently using it in my bathroom as a toothbrush holder. They added some Jasmine Green Tea. Guess what? That's one of my favorite kinds of tea to drink. Isn't this bag of popcorn cute? 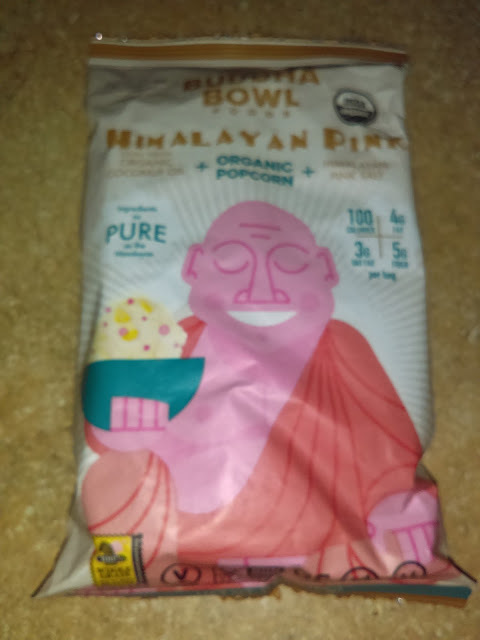 Buddha Bowl Himalayan Pink popcorn. It's organic and VEGAN!!! Yes! Okay, so believe it or not, but I think this box is amazing. It kind of felt like the creators went inside of my head and picked out things that they knew I would love. Seriously thrilled to have gotten a box for review. To learn more about JadeCrate, visit their website. Disclaimer: I received this box in exchange for my unbiased review.